Aspectos controversiales en relación al manejo de los terceros molares asintomáticos. José P. Crestanello Nese Universidad Católica del Uruguay (UCU). de discutir y clarificar alguno de los aspectos controversiales respecto al manejo de los 3M asintomáticos. Cirujano Buco Maxilofacial. Coordinador del Servicio de Cirugía Buco Maxilofacial del Hospital Maciel. Molars Associated With No Gross Pathology. J Oral Maxillofac Surg; 67: 856 – 861. Jordanians. J Oral Maxillofac Surg; 64: 1598 – 1602. Almendros–Marqués N, Alaejos–Algarra E, Quinteros–Borgarello M, Berini–Aytés L, Gay–Escoda C. (2008). Factors influencing the prophylactic removal of symptomatic impacted lower third molars. In J Oral Maxillofac Surg; 37: 29 – 35. Andrews W. (2008) AP Relationship of the Maxillary Central Incisors to the Forehead in Adult White Females. Angle Orthodontist; 78: 662 – 69. Assael L. (2005) Indications for Elective Therapeutic Third Molar Removal: The Evidence Is. In J Oral Maxillofac Surg; 63: 1691 – 1692. North Am; 19: 15 – 21. Bernabe E, Flores–Mir C. (2007) Influence of Anterior Occlusal Characteristics on Selfperceived Dental Appearance in Young Adults. Angle Orthodontist; 77: 831 – 36. Bishara, S. (1999) Third molars: A dilemma! Or is it? Am J Orthod Dentofacial Orthop;115: 628 – 33. Bramante M. (1990) Controversies in orthodontics. Dent Clin North Am; 34: 91 – 102. Bouloux, G, Steed M, Perciaccante V. (2007) Complications of Third Molar Surgery. Oral Maxillofac Surg Clin North Am; 19: 117 – 128. Buttke T, Proffit W. (1999) Referring adult patients for orthodontic treatment. J Am Dent Assoc; 130: 73 – 79. Cavalcanti M, Veltrini V, Ruprecht A, Vincent S, Robinson R. (2005) Squamous-cell carcinoma arising from an odontogenic cyst. The importance of computed tomography in the diagnosis of malignancy Oral Surg Oral Med Oral Pathol Oral Radiol Endod; 100: 365 – 8. Maxillofac Surg; 65: 1685 – 1692. Díaz J, Pérez R, Rodríguez M, Ruiz M. (1998) Valoración de la presencia y estado de erupción del tercer molar inferior en las fracturas del ángulo mandibular. Rev Cubana Estomatol; 35: 102 – 6. Dodson T. (2009) Fact-Based Versus Evidenced – Based Policy Positions: Confessions of an Accidental Politician. J Oral Maxillofac Surg; 67: 1153 – 1154. Dodson T. (2007) Is There a Role for Reconstructive Techniques to Prevent Periodontal Defects After Third Molar Surgery? Oral Maxillofac Surg Clin N Am; 19: 99 – 104. Dodson T, Richardson D. (2007) Risk of Periodontal Defects After Third Molar Surgery: An Exercise in Evidence–based Clinical Decision–making. Oral Maxillofac Surg Clin N Am; 19: 93 – 98. Duan D, Zhang Y. (2008) Does the presence of mandibular third molars increase the risk of angle fracture and simultaneously decrease the risk of condylar fracture? In J Oral Maxillofac Surg; 37: 25 – 28. Fanibunda K, Soames J. (1995) Malignant and Premalignant Change in Odontogenic Cysts. J Oral Maxillofac Surg; 53: 1469 – 1472. Fernandes M, Ogden G, Pitts N, Ogston S, Ruta D. (2009) Summary of: Incidence of symptoms in previously symptomfree impacted lower third molars assessed in general dental practice. British Dental Journal; 207: 218 – 219. Frank C. (2000) Treatment options for impacted teeth. J Am Dent Assoc; 131: 623 – 32. Haug R, Abdul–Majid J, Blakey G, White R. (2009) Evidenced–Based Decision Making: The Third Molar. Dent Clin N Am; 53: 77 – 96. Haug R, Perrott D, Gonzalez M, Talwar R. (2005) The American Association of Oral and Maxillofacial Surgeons Age– Related Third Molar Study. J Oral Maxillofac Surg; 63: 1106 – 1114. Hill M. (2006) Removal of Asymptomatic Third Molars: An Opposing View. J Oral Maxillofac Surg; 64: 1816 – 1820. Hupp J. (2007) Legal Implications of Third Molar Removal. Oral Maxillofac Surg Clin N Am; 19: 129 – 136.
fractures and the status of incompletely erupted mandibular third molar. J Cranio – Maxillofac Surg; 33: 158 – 163. Libersa P, Roze D, Cachart T. (2002) Immediate and late mandibular fractures after third molar removal. J Oral Maxillofac Surg; 60: 163 – 65. Lindauer S, Laskin D, Tüfekçi E. (2007) Taylor R, Cushing B, Best A. (2007) Orthodontists’ and surgeons’ opinions on the role of third molars as a cause of dental crowding. Am J Orthod Dentofac Orthop; 132: 43 – 48. Meisami T, Sojat A, Sàndor G, Lawrence H, Clokie C. (2002) Impacted third molars and risk of angle fracture. Int J Oral Maxillofac Surg; 31: 140 – 44. Marciani R. (2007) Third Molar Removal: An Overview of Indications, Imaging, Evaluation, and Assessment of Risk. Oral Maxillofac Surg Clin N Am; 19: 1 – 13.
www.nice.org.uk/pdf/wisdomteethguidance.pdf. Accessed September 9, 2009. Nitzan D, Karen T, Marmary Y. (1981) Does an impacted tooth cause root resorption of the adyacente one? Oral Surg, Oral Med, Oral Pathol; 51: 221 – 224. Perry P. (2002) Discussion of Immediate and late mandibular fractures after third molar removal. J Oral Maxillofac Surg; 60: 165 – 166.
maxillofacial surgeons. J Oral Maxillofac Surg; 58: 858 – 61. Rafetto L. (2006) Removal of Asymptomatic Third Molars: A Supporting View. J Oral Maxillofac Surg; 64: 1811 – 1815. Ries Centeno G. (1964) Cirugía Bucal. 6ta. Ed., Buenos Aíres, El Ateneo, p. 819. Sanchez M., Vicente A., Bravo L. (2009) Third Molar Agenesis and Craniofacial Morphology. Angle Orthod; 79: 473 – 478. Sandhu S, Kaur T. (2008) Radiographic Study of the Positional Changes and Eruption of Impacted Third Molars in Young Adults of an Asian Indian Population. J Oral Maxillofac Surg; 66: 1617 – 1624. Perception After Surgical Removal of Third Molars. J Oral Maxillofac Surg; 67: 1083 – 1091. Subhashraj K. (2009) A Study on the Impact of Mandibular Third Molars on Angle Fractures. J Oral Maxillofac Surg; 67:968 - 972. Susarla S, Blaeser B, Magalnick D. (2003) Third molar surgery and associated complications. Oral Maxillofac Surg Clin N Am; 15: 177 – 186. Susarla S, Dodson T. (2005) How Well Do Clinicians Estimate Third Molar Extraction Difficulty? J Oral Maxillofac Surg; 63: 191 - 199. Orthodontists about the Role of Erupting Third Molars as a Cause of Dental Crowding. Angle Orthod; 79: 1139 – 1142. Wagner K, Otten J, Schoen R, Schmelzeisen R. (2005) Pathological mandibular fractures following third molar removal. Int J Oral Maxillofac Surg; 34: 722 – 26. Zadik Y, Levin L. (2007) Decision Making of Israeli, East European, and South American Dental School Graduates in Third Molar Surgery: Is There a Difference? J Oral Maxillofac Surg; 65: 658 – 662. Ziccardi V, Zuniga J. (2007) Nerve Injuries After Third Molar Removal. Oral Maxillofacial Surg Clin N Am; 19: 105–115. CRESTANELLO NESE, José P.. Aspectos controversiales en relación al manejo de los terceros molares asintomáticos.. Actas Odontológicas (Publicación discontinuada), [S.l. ], v. 7, n. 2, p. 63-76, apr. 2016. ISSN 2393-6304. 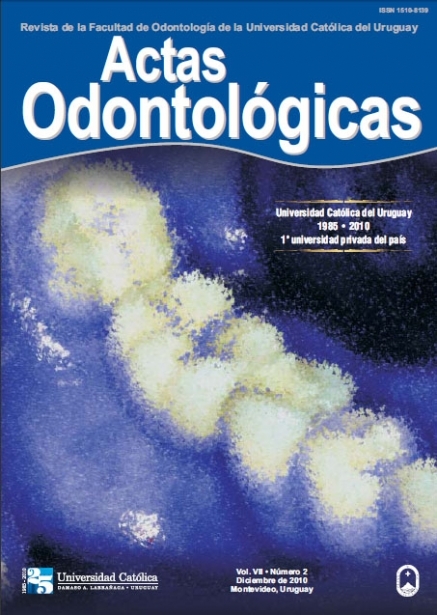 Disponible en: <http://revistas.ucu.edu.uy/index.php/actasodontologicas/article/view/1064>. Fecha de acceso: 21 apr. 2019 doi: https://doi.org/10.22235/ao.v7i2.1064.